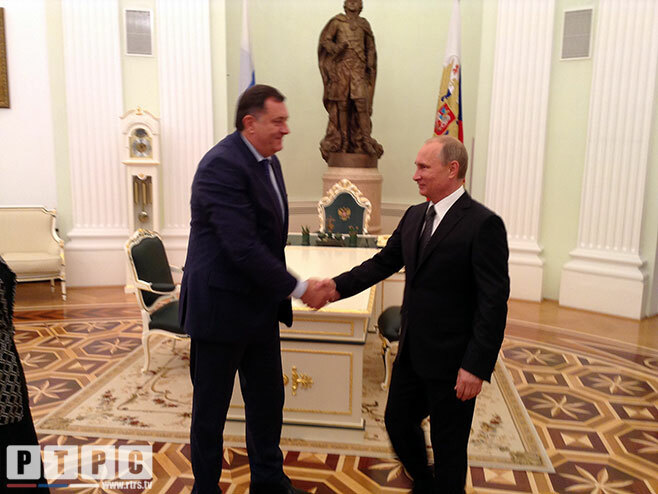 Moscow – Russian President Vladimir Putin has wished Republika Srpska President Milorad Dodik success in the upcoming general elections in BiH, stating that he is familiar with the fact that President Dodik enjoys support of a significant number of voters. “You will soon have elections. I wish you success. I know you are supported by a great number of voters, this is now already clear”, said Putin at the meeting with Srpska President Milorad Dodik and Prime Minister Zeljka Cvijanovic held in Moscow. Welcoming Srpska’s delegation Putin recalled that he had already met with Dodik this year, reads the statement at the Russian President’s website. “You are a highly experienced man, and politician, and economist. You understand these issues very well. I am very glad to see you”, said Putin. Noting that these are very complex times in international relations and in Europe and the world economy Putin emphasized that the relations between Russia and Srpska were developing successfully, which is important for the situation in the region. “ I am glad to be able to say that, although the figures relating to our trade and economic cooperation are quite modest, there is increase in the exchange of goods, thus it has recently gone up one-quarter”, said Putin. He noted that elections had been recently held in Russia for 84 subjects of the Russian Federation, which accounted for the greatest elections in the history of Russia, both municipal and regional. “A large number of Russian Federation regional administrators were elected. We therefore understand that the internal political situation is always taking a new, accelerated tempo during the pre-election period. However, after the elections, the everyday work will still go back to normal”, Putin said.